CIT provides a virtual private network (VPN) service to staff whereby staff can log in and access CIT IT services from home or when travelling. 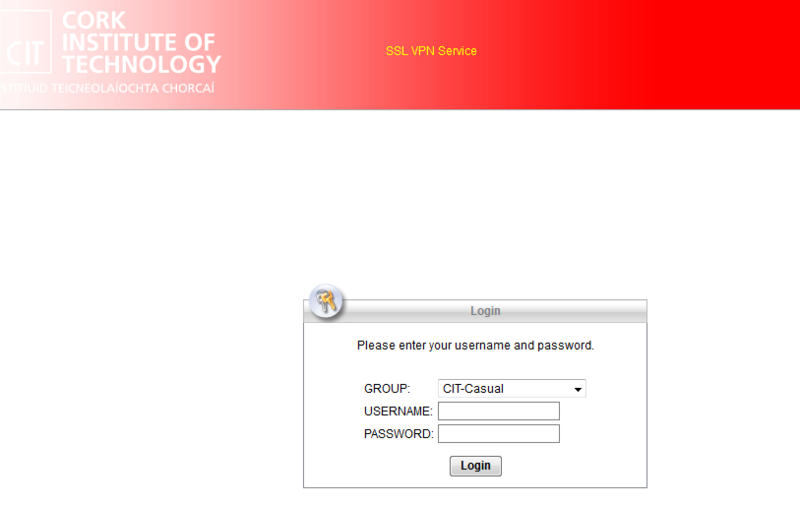 Login to the CIT Staff Gateway (http://gateway.cit.ie) and click the Web VPN button in the Staff Services column. Select your group from the drop-down menu (e.g. CIT-Staff), then log in using your staff username (in the format firstname.surname@cit.ie) and password, as you would to log in to your staff email or to to your CIT network account. CIT Web Applications such as Core HR & Payroll, Gateway documents, Library databases, CIT Email, etc.